If you haven’t had Ethiopian food, you are in for an incredible treat. Not only is it rich with flavors and spices and but often it is served with (or on top of) a spongy bread called injera. This slightly sour bread is filled with holes, so the sauces and flavors from the stews and dishes soak into it for added deliciousness. And the best part, injera is also your utensil for eating your meal! You just rip a piece off from the large platter and scoop up the various dishes served on top. Injera is made from a grain called teff. This small, round grain is found throughout Ethiopia and contains very little gluten, thus does not make a raised bread, but rather a flat bread. When teff is added with yeast, and allowed to sit for up to 2 days, it produces a tangy sour taste perfect for making into flat bread and complementing the many meats, stews and vegetable dishes it is served with. Many injera recipes have been modified by adding a flour to the recipe as well, but true injera from Ethiopia would only be made with teff flour. 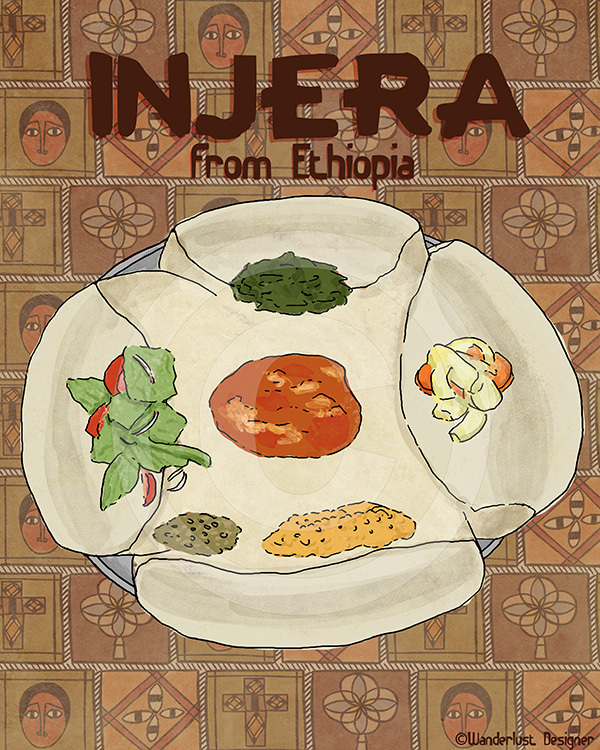 Below are 2 different recipes for injera. Be sure to also see my Ethiopian Berebere spice mix recipe for ideas on foods to serve with this flatbread. Do you have a favorite food you’d like illustrated? Please contact me for details.